We’d love your help. Let us know what’s wrong with this preview of Show Your Work! by Austin Kleon. To ask other readers questions about Show Your Work!, please sign up. Show Your Work reading list! This was the kick I needed! I loved my reading experience with this book - it fell into my lap quite unexpectedly, full of my friend's annotations, and I flew through it. I had such a riot getting inspired and rethinking what the aims of creation should be. Full of quotations from a HUGE variety of creative types, full of manageable but impactful ideas, and with an excellent understanding of modern times and the tools we have at our disposable, this was a treat. A TREAT. I really recommend this - This was the kick I needed! I loved my reading experience with this book - it fell into my lap quite unexpectedly, full of my friend's annotations, and I flew through it. I had such a riot getting inspired and rethinking what the aims of creation should be. Full of quotations from a HUGE variety of creative types, full of manageable but impactful ideas, and with an excellent understanding of modern times and the tools we have at our disposable, this was a treat. A TREAT. Having just finished Austin Kleon's previous book Steal Like an Artist, which I liked but didn't LOVE... I didn't expect anything different here. I mean, the book's exactly the same size and shape, the same layout, similar in approach. But this one hit me right between the eyes half a dozen times over. I immediately started rereading this one, a library copy, and bought this one and Steal Like an Artist. I suspect that I didn't click with the first one because I read it too quickly and didn't rea Having just finished Austin Kleon's previous book Steal Like an Artist, which I liked but didn't LOVE... I didn't expect anything different here. I mean, the book's exactly the same size and shape, the same layout, similar in approach. But this one hit me right between the eyes half a dozen times over. I immediately started rereading this one, a library copy, and bought this one and Steal Like an Artist. I suspect that I didn't click with the first one because I read it too quickly and didn't really let it settle in. Or maybe it just speaks to a different stage of the artistic journey than I'm on. But Show Your Work... Oh, goodness. The second night I was reading it, I sat up four hours past my bedtime curating photo streams, removing the junk and the fluff, the "so what?" stuff that Austin speaks about. I kept in the stream photos of things-in-process, whether my new attempts at sketchnoting (and I'm NOT a drawing artist) or my attempts at yoga (I'm a middle-aged guy, inflexible and newb-like). I culled old photos of lattes and omelettes. I moved nearly two hundred photos of my family - fine snapshots, but not where I found creative inspiration for this stream - from my photo stream up to Facebook, where more folks are enjoying them as family photos anyway. Grandma and friends are there, not waiting on my photo streams. Four hours. I also wrote six pages of journal notes, some by hand, some electronically; began to reshape my 9-year-old blog that I've left to die many times over. I revisited the great question of how I can find the metanarrative between all my distinct interests and outputs, to see what the main through-line is. It's not just Show Your Work alone that sparked this - it was also much of David Whyte's poetry and lectures, as well as learning to doodle note and sketch note - but Kleon's book shaped and unblocked so much. I loved Austin's first book, Steal Like an Artist, and did exactly what he told me, including buying extra copies of his book and giving it to all my friends. As a writer and an artist, his advice is simple, inspiring, and fun to follow. I still use that book as a reference when I need a pick-me-up. 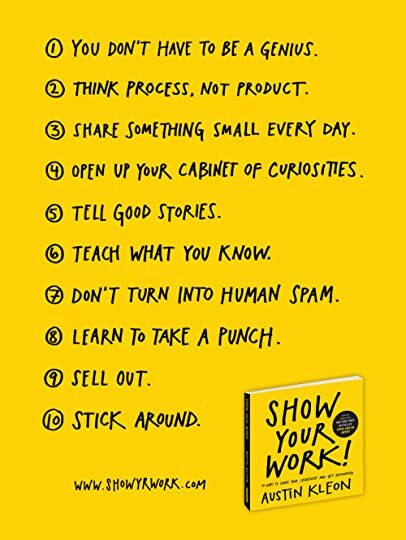 His new book, Show Your Work!, feeds the need for those of us who wanted more! It's the same format - quick chapters with full page black and white photos, quotes from famous folks that you will be pi I loved Austin's first book, Steal Like an Artist, and did exactly what he told me, including buying extra copies of his book and giving it to all my friends. As a writer and an artist, his advice is simple, inspiring, and fun to follow. I still use that book as a reference when I need a pick-me-up. His new book, Show Your Work!, feeds the need for those of us who wanted more! It's the same format - quick chapters with full page black and white photos, quotes from famous folks that you will be pinning to your studio walls,lots of his newspaper blackout phrases, and the same simple noteworthy advice that Kleon is so good at! Building off of his first book, Kleon encourages the artist, writer, or anyone creative to dig a bit deeper to reach their audience. He teaches you how to introduce yourself at a party, how not to be human spam, to tell good stories, to share something small everyday, to build a mailing list. But then there are good life lessons like stepping away from what you are doing, or starting over, teach what you know, think process not product, and so much more. If you are looking for a step-by-step how-to guide to getting rich and famous at novel writing or art selling, this isn't it. But if you want a fun cheerleader-type book chocked full of good advice that's to the point and easy to follow, Kleon is your man. This book would make a great gift for the artist in your life, if you aren't one yourself. But as an artist or writer, you have to follow through! Follow him on Twitter, do the little things he suggests, scratch each others' backs, and show your work! It really works - removing the stress from your creativity and helping you to step back and see the bigger picture! I always feel energized and ready to dive in after reading his books. More than anything else, I felt really validated as I read Kleon's newest piece. It made me think of the very early days when Avid Bookshop was just a dream, when I was sharing my ups and downs with folks and hoping against hope that someday my business would be a vibrant brick-and-mortar bookstore. If you are a creator of any kind--and all of us are, or can be--this book will inspire you and make you feel empowered. Are you going to read this book because my review influenced you? Then check it More than anything else, I felt really validated as I read Kleon's newest piece. It made me think of the very early days when Avid Bookshop was just a dream, when I was sharing my ups and downs with folks and hoping against hope that someday my business would be a vibrant brick-and-mortar bookstore. If you are a creator of any kind--and all of us are, or can be--this book will inspire you and make you feel empowered. Funny, smart, observant. So much of what Kleon writes resonates with me as a writer who blogs and tweets. Great ideas about building your tribe and sharing ideas. Me ha gustado mucho y ha caído en dos días. Te aconseja pasos muy sencillos y que pueden sacarse por lógica, pero el verlo escritos y todos unidos, hacen que tengan mucha más entidad y te lo tomes como una especie de "procedimiento". Mi tip favorito: "Comparte algo pequeño cada día". Me ha parecido muy motivador y creo que sigue una línea muy real, que ojalá yo misma pueda llevar acabo. Una página de preguntas me ha dado una idea genial para el blog que esperar poner en práctica. Y por último: Amor Me ha gustado mucho y ha caído en dos días. This is an excellent primer on self-promotion for artists. I have to admit that I picked it up with some skepticism, just as I did with Steal Like an Artist. This follow-up has the same slick look about it, with Kleon's subtractive poetry and ample quotes from other artists. But, just as with the other book, as soon as I started reading, I was sold on it. I loved what this book had to say. The Goodreads summary covers the bullet points well, but what I liked most was his emphasis on how to make q This is an excellent primer on self-promotion for artists. I have to admit that I picked it up with some skepticism, just as I did with Steal Like an Artist. This follow-up has the same slick look about it, with Kleon's subtractive poetry and ample quotes from other artists. But, just as with the other book, as soon as I started reading, I was sold on it. I loved what this book had to say. The Goodreads summary covers the bullet points well, but what I liked most was his emphasis on how to make quality connections. A huge number of followers really means nothing if they don't care about what you do. It's about being part of a community, more than creating a network. After all, you create things because you are a fan. Find the other fans and you will find your audience, too. This approach meshes perfectly with the first book. Here, he shows how to make it possible for other artists to "steal" from you. Brilliant. "Whatever we say, we're always talking about ourselves." -- Alison Bechdel. And I could add, whenever we talk, we're always telling stories. Why do we write or make art or pursue creativity of any sort? The answer? To be more ourselves, to show who we are, to make a connection, to find our tribe. Austin Kleon, the author of this book is a "writer who draws" and in sharing himself here, he takes his readers deep into the element of connecting. In particular, he offers up suggestions of how to get your work out there. He's an advocate of using the tools of the day (aka social media) to #ShowYourWork, while also learning to "take a punch" (survive the criticism that naturally comes from putting yourself out there) and avoiding the harmful trolls. Anytime I need some inspiration or encouragement in my creative endeavors, I turn to Austin Kleon. His words get me so pumped up and inspired, and his books never let me down. Austin Kleon sugrįžta su dar 10 patarimų, tik šįkart ne apie kūrybos šaltinius, o kaip juos panaudoti ir pagaliau tapti žinomu kūrėju. Nuo sugriaunamo vienišo genijaus mito iki patarimo nesustoti Austin'as Kleon'as drąsina rodyti savo darbus pasauliui. Taip pat išmokti priimti smūgį t.y. kritiką, kurio sulauksi, rodydamas darbą visiems, o ne tik tave palaikantiems žmonėms. Austin Kleon is back with another 10 advice, but this time not about sources of creativity, but about how to get known by what you do. You don't have to be genius, turn into human span you just have to stick around with things you love to do long enough and show it to people. Learn to take a punch and don't stop create. Thank you @austinkleon for these amazing books and greetings fron Lithuanian readers! Ако в „Кради като артист“ основната теза беше, че най-ценното вдъхновение можем да намерим чрез имитацията и любимите произведения от идолите ни (с важното разграничение от плагиатството, разбира се), то тук Клиън доказва, че образът на затворения в хралупата си творец, който ненавижда света, е морално остарял в ерата на социалните мрежи и постоянното споделяне. Същевременно Клиън ни предупреждава да не се превръщаме в „човешки спам“ и дава съвети как да теглим чертата между разкриването на съществени и несъществени детайли от живота ни. С две думи, хвърля светлина върху това как да се покажем, без да се изложим. Той ни убеждава, че публиката искрено се интересува от работния ни процес, от погледа зад кулисите, в кухнята, в печката – наречето го както искате. Същността на всичките му съвети е да изградим връзка с аудиторията и колегите си, която ще ни облагодетелства в бъдеще. 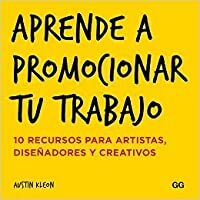 This beautifully-written book is a reference to artists specifically and to all people in general who have the potential to do something and establish a name in social industry. Ten Guidelines will direct you to the way of how to present your work to others, be accepted, influence and get influenced by, and most importantly, to stick around. It has been very helpful in shaping the way you look to the products you make and to the process in which these products are made. I intend to put it on my This beautifully-written book is a reference to artists specifically and to all people in general who have the potential to do something and establish a name in social industry. Ten Guidelines will direct you to the way of how to present your work to others, be accepted, influence and get influenced by, and most importantly, to stick around. It has been very helpful in shaping the way you look to the products you make and to the process in which these products are made. I intend to put it on my references list. Reading this book will not take much time, its language is easy and modern to the mentality of nowadays youth. This is the type of book that you really need to have with you and read it every time you feel that you need some inspiration! And, as a former obituary writer myself, I was delighted to discover Kleon recommends reading the obits every day. There's nothing like an interesting obit to remind you that we all die, but that there is so much that can be done while we're still breathing, and you might as well get on with it while you are. And. as Kleon says, a bad review never killed anyone yet. Get out there and get on with your art. Ban đầu không ưa cái thể loại này vì cái tiêu đề hơi lố: PR BẢN THÂN. Thường thì bản thân không cần PR quảng cáo, nghĩ đơn giản là nếu có gì đó hay ho thì sẽ nổi tiếng. Suy nghĩ đó đúng chứ, nên cũng đâu có ý định đọc cuốn này làm gì. Mình nhất quyết đọc nó. Một luồng suy nghĩ mới tác giả thổi vào đầu mình. Cuốn sách dành cho những ai GHÉT PR BẢN THÂN. Nghe thấy ngược với tiêu đề sách. Cuốn sách nói về HÀO PHÒNG CHIA SẺ CÔNG VIỆC BẠN ĐAN Ban đầu không ưa cái thể loại này vì cái tiêu đề hơi lố: PR BẢN THÂN. thông qua những gì BẠN CHIA SẺ. Gút lại, bạn MẠNH DẠN CHIA SẺ, rồi có một cộng đồng nho nhỏ, rồi cộng đồng ấy giúp ngược lại bạn vì họ biết gu của ban. Cho nên, tác giả gửi gắm thông điệp. Mạnh dạn chia sẻ công việc của mình. 6. Làm điều này cùng giúp MÌNH NHÌN QUÁ TRÌNH LÀM VIỆC RÕ RÀNG HƠN. 9. Thông điệp gửi đi ra ngoài, thì nhớ qua bài test: CÓ CÁI QUÁI GÌ ĐẶC BIỆT KO? 10. Để có thông điệp, thì cần TÍCH TRỮ TRỮ LƯỢNG ý tưởng nhỏ nhỏ mỗi ngày. Từ ý tưởng, thành câu từ, từ câu từ thành bài báo, từ bài báo thành chương sách. 14. Luôn để nguồn tham khảo? Vì sao, vì sao? Vì đó là cách tôn trọng độc giả, giúp họ CÓ NGUỒN ĐÀO SÂU THÊM THÔNG TIN. Đừng chia sẻ thử bạn không thể trích rõ nguồn. 15. Để kể chuyện hay, cần biết KỊCH BẢN CÂU CHUYỆN. Kịch bản của Dan Harmon: (1) một nhân vật trong vùng an toàn, (2) nhưng họ muốn có thứ gì đó, (3) họ bước vào một cảnh không quen thuộc, (4) thích nghi với nó, (5) có được thứ họ muốn, (6) họ trả một cái giá khá đắt để có được nó, (7) trở về với hoàn cảnh quen thuộc, (8) họ đã thay đổi. Có nhiều kịch bản viết, nhưng thích kịch bản kiểu nà. 16. Bạn phải TỰ VIẾT RA CÂU CHUYỆN CỦA RIÊNG MÌNH! 17. Nhưng có CÁCH NÀO ĐỂ KỂ CHUYỆN CHƯA HỒI KẾT? Bạn làm nghề gì! Sáng tôi bán hàng online, chiều tối tôi tập vẽ kể chuyện. 23. Tích cực gặp mặt chạm mặt. Tác dụng lớn nhất của internet ư. Đó là CHÚNG TA ĐƯỢC NGỒI ĐÂY. Gặp mặt họ ở đâu? 25. Mẹ!!! Mọi người đều nói họ muốn nghệ sĩ kiếm được tiền, nhưng khi nghệ sĩ kiếm được tiền, mọi người lại ghét họ! Thế cuộc sống đáng giá bao nhiêu? 28. 7 năm nghỉ phép 1 năm. – Stefan Sagmeister. “Kết cục câu chuyện có tốt đẹp hay không, phụ thuộc vào việc bạn đặt dấu chấm hết cho câu chuyện ở đâu” – Diễn viên Orson Welles. Twee grootste Ik kwam als eerste in contact met Austin Kleon door het boek ‘Steal like an artist’. Ik was onder de indruk van zijn originele manier van illustreren gecombineerd met korte bondige teksten. 1. It sounds a little extreme, but in this day and age, if your work isn’t online, it doesn’t exist. 2. They’re cranking away in their studios, their laboratories, or their cubicles, but instead of maintaining absolute secrecy and hoarding their work, they’re open about what they’re working on, and they’re consistently posting bits and pieces of their work, their ideas, and what they’re learning online. 3. Make stuff you love and talk about stuff you love and you’ll attract people who love that kind of stuff. It’s that simple. 4. Instead of wasting their time “networking,” they’re taking advantage of the network. 5. If an opportunity comes along that will allow you to do more of the kind of work you want to do, say Yes. If an opportunity comes along that would mean more money, but less of the kind of work you want to do, say No. 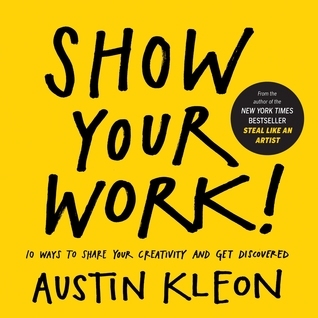 The main Austin Kleon’s Show Your Work, is a great follow up to his highly successful Steal Like an Artist; once you have been inspired and created work, you need to share your efforts with the world. Show Your Work is very simply written, using bold statements, art/poetry, quotes, and hand-drawn charts to elaborate on the author’s ideas. I appreciated Kleon’s bare bones style of writing; for this subject matter it really helps to get the point across simply and makes what he is saying memorable. Walaupun nggak seaktif dan semenarik Steal Like an Artist, tapi buku ini nggak kalah penting. Di sini, Austin Kleon membahas bagaimana cara membagi proses kreatif saat membuat karya untuk mendapat impresi dari calon penikmat karya. Bacaan yang relevan untuk dibaca semua pelaku kreatif yang hidup di era digital, di mana internet adalah medium yang tepat untuk memamerkan karya. Ada satu kutipan yang bikin spontan ketawa. Mungkin bagi sebagian orang nggak lucu, tapi rasanya agak realistis. "Kita haru Walaupun nggak seaktif dan semenarik Steal Like an Artist, tapi buku ini nggak kalah penting. "Kita harus mengakhiri romantisme 'seniman melarat' dan pemikiran bahwa 'mengurusi' uang bisa merusak kreativitas." Apa yang salah dari kreativitas yang dibayar? Yang salah itu kalau menghentikan kreativitas hanya karena nggak dibayar. When I was younger, I thought that if I just wrote the perfect story, people would love, I would be discovered, and then I'd have it made. That hasn't worked out the way I planned. I've come around to Austin Kleon's way of thinking: I love the encouragement to share my work as I'm doing it, rather than hoarding it until it's polished and perfect. The book is breezy and short, but I found nuggets of inspiration. I'm eager to put some of his advice into effect and see if it makes a difference. ...but in this day and age, if your work isn’t online, it doesn’t exist. But it is also hard to keep up with all the social media! The cat sat on a mat’is not a story. ‘The cat sat on the dog’s mat’is a story. Enjoyed much of this quick but rich overview of ways in which sharing ideas, work, (etc) can be useful for both the author and his audience. Lots of practical ideas, most of which could be boiled down to what happens when you keep a blog regularly updated. Highly recommended to anyone who thinks for a living. My mom gave me this book and I was surprised that it actually is a great little fast read and reference guide to sharing your work in the modern world of social media and the Internet. I am sure I will refer back to this at some point. It has some good ideas written in an easy to digest format. 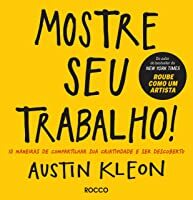 Apesar do do título do livro e, até mesmo do foco do mesmo, o livro traz 10 tópicos que não servem apenas como dicas para divulgação do seu trabalho, mas dicas de como encarar a vida e enfrentar os problemas diários. Por exemplo, a primeira dica do livro é seja um amador, pois amadores não tem nada a perder, não tem medo de errar e estão dispostos a aprender, do meu ponto de vista esse não é um conselho apenas sobre trabalho, mas um conselho sobre a vida. Eu traduzi esse conselho como: não tenha Apesar do do título do livro e, até mesmo do foco do mesmo, o livro traz 10 tópicos que não servem apenas como dicas para divulgação do seu trabalho, mas dicas de como encarar a vida e enfrentar os problemas diários. Por exemplo, a primeira dica do livro é seja um amador, pois amadores não tem nada a perder, não tem medo de errar e estão dispostos a aprender, do meu ponto de vista esse não é um conselho apenas sobre trabalho, mas um conselho sobre a vida. Eu traduzi esse conselho como: não tenha vergonha de viver. Para quem interessar, não achei a leitura do livro na língua original (inglês) difícil, possui uma outra expressão mais complexa, as quais precisar procurar uma definição ou até mesmo um tradução, mas num geral é bem tranquilo de se ler. 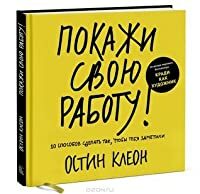 Определено не ми беше интересна колкото "кради като артист", но и в тази книга имаше доста полезни съвети.